In this latest article, Wayne Richards, takes all the design considerations for building a DIY skibike and looks at what parts are on the market to build one. OK we have looked at basic requirements, such as frame desirables, frame head angle, skis and a bit of advice about only building a ski bike if you think you can build it less than 10 kilos, with clearance over the rear swinging arm for the chairlift. Already a lot of you are saying “nah can’t be done, the manufacturer’s bikes are heavier than that and not all have clearance”. Spend your dollars, build that “clunker” and you will be disappointed, can’t say any more than that. Shall we move on then to those who are prepared to be modern, use good design and end up with a 2012 model ski bike, it’s not difficult, you just need to pre-plan and think things through a bit. Frames: really really think what donor frame you are going to use, it is the starting point for all the other bits and pieces. Think what you want to do on your ski bike and relate it to good Mtb build practice, if you want to jump and do tricks then get a more durable and tough frame, long cruising all day frame, think Enduro or XCountry frame, on piste cruiser, you can get away with a very light weight frame with 100mm or less rear suspension. Pick a good brand with a good quality rear shock, you may pay a few dollars more, but you will end up with an asset that can be resold. A Specialised Comp XC would be an ideal candidate. 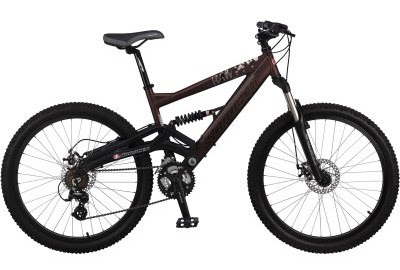 The Saracen Raw, a cheap version with not such a good shock, but tough, well built and more importantly, with the downhill style forward of centre pivot I favour. 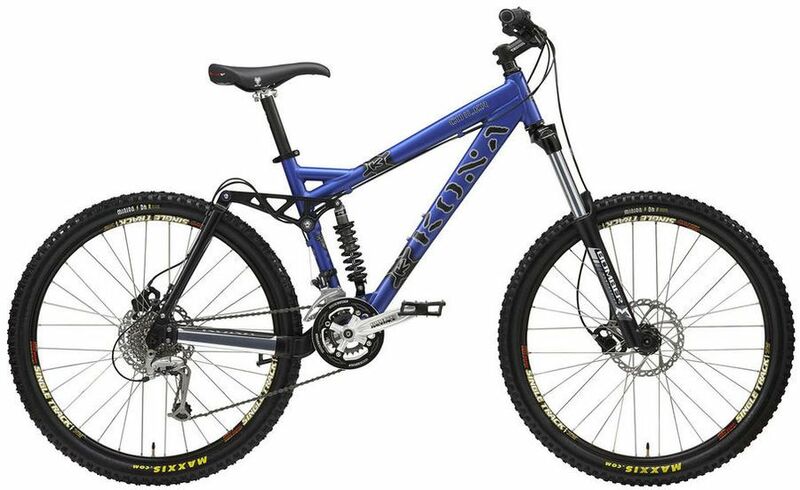 On Ebay complete bikes are under £ 100.00 sometimes. Another way to think about things is ask yourself if you would enjoy riding that bike when built up as a MTB, if not then why would you build it into a ski bike. The way we ride ski bikes is not un-similar to Mtbs, we just have skis instead of wheels. Not all frames are suitable, even some of the more high end frames. Have a look at the Kona Coiler frame, high end well regarded Mtb frame, but as a ski bike, mmm you can see what I am getting at, those big sticky out things at the back, just ready to get caught on the base of the chairlift. So pick a good frame with care, your local supermarket special just may do you ski bike career more harm than good. Do your research and look at the frame weights, if you are going to get into a porky frame, its going to be pretty tough to reduce all the other components weight to compensate. Next thing to consider is front forks. I am sort of starting to side that 100mm is more than enough for most purposes on a ski bike, we just don’t have the drop offs in snow that we do in Mtb-ing. When we do drop off it tends to be onto a sloped run off where the slope dissipates most of the impact. So why do we need long travel. Well we need long travel ( more than 100mm ) to push the nose higher to increase the head angle ( think more stable steering feel ) and to give better clearance under the pegs. If possible buy a fork that has had the steerer tube uncut, put the spacers under the bottom bearing rather than above to push the nose up higher. Do make sure the spacer will locate the bearing properly though, some spacers will, others won’t. I feel also that we can have the front travel much stiffer than we normally do in Mtbing, most bumps and jumps are pretty smooth and not sharp faced as per a rocky ledge or step, skiers without suspenders on go across these little undulations all day long. What’s good, unfortunately with suspension forks what you tend to pay for is what you get. Again check out the likes of eBay for second hand stuff that somebody's trading off, there are bargains to be had. Marzocchi Marathons at 1.5 kilos 100mm travel, stunning. Check here before you buy anything though as to regards weights. Get above 1.6kilos for a front fork and you really have to think I can do better. Ancillaries such as seats, seat posts, handlebars, pegs, you can so wrong so quickly as far as weights go. Do your research and use your budget wisely. Do you really need a big thick gel padded seat if you peg all the time. On a recent trip, one of the bikes seat pin broke. We took my seat off ( I peg ) and I rode without a seat for the whole day, didn’t really notice it missing to be honest. 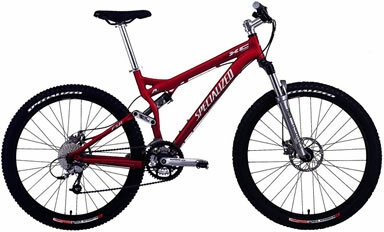 So fit the minimum weight your budget will allow without any recourse to comfort if you are a freestyler. If you ride easy rider style than a well padded seat is essential, don’t worry about the bit extra weight, just don’t have that extra two pints of beer on the way home. Well that’s enough for the moment, but I can’t stress enough that there are some fundamental things to be aware of before converting a Mtb frame to a skibike. Minimum weight is just so important, clearance for the chairlift, design nouse to get the right peg height, design nouse pre-planning to be done guys and girls, get it right and you yourself will not only benefit, but the whole sport will benefit with you show casing your bike. Get it wrong and you will probably alienate the lift company who may ban all bikes.